The place now occupied by 1111 Broadway was once the Bacon Building, also known as the Bacon Block. It was named for Henry Douglas Bacon (1818-1893), “a pioneer capitalist of this city” who is also remembered at U.C. Berkeley as the benefactor behind the old Bacon Hall library building. The Bacon Block or Bacon Building was the second structure here. The original Bacon Block, a wooden building that housed Smith’s Market and many other small businesses, burned on December 30, 1902. The newer steel and concrete structure housed many business offices as of 1906. 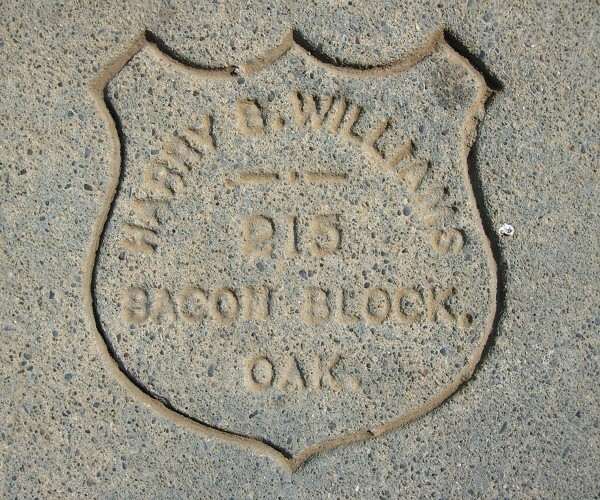 At least four businesses in the Bacon Block/Building left their marks on Oakland’s sidewalks. 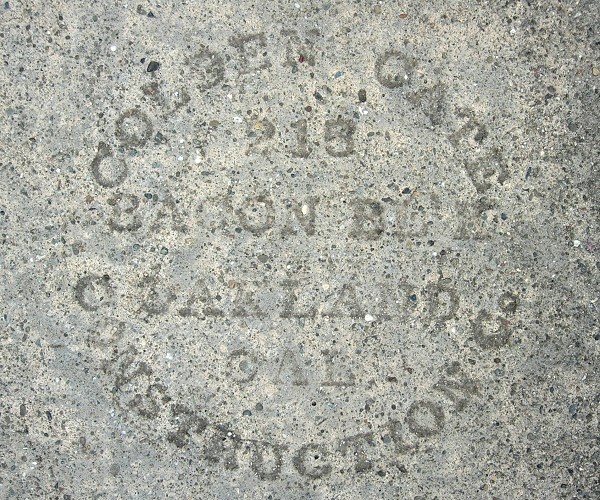 The Golden Gate Construction Company, “215 BACON BL’K”, was listed in the San Francisco directories of 1902 and 1907. It was listed in the 1910 Oakland directory at this address, but not in any other year. The listing also said, “Harry B Williams mngr.” Oakland has a handful of these hard-to-read marks, none of them with a date. I suspect this firm also left the G. G. C. Co. mark, of which I’ve seen maybe three examples. Harry B. Williams succeeded Golden Gate in the same office. The firm is first listed in the 1912 directory, with Harry B. (not to be confused with the more prominent contractor Harry C. Williams) living at 905 61st Street. The 1913 and later directories have him living at 915 61st Street. The 1914 directory of Rotarians lists him. In 1921 the business was listed at 1106 Broadway, which was across the street in today’s Key System Building, and a garage is also mentioned out at 61st Street. I think he was probably using his second stamp at that time. His marks are thinly scattered in north and central Oakland, none with a date. 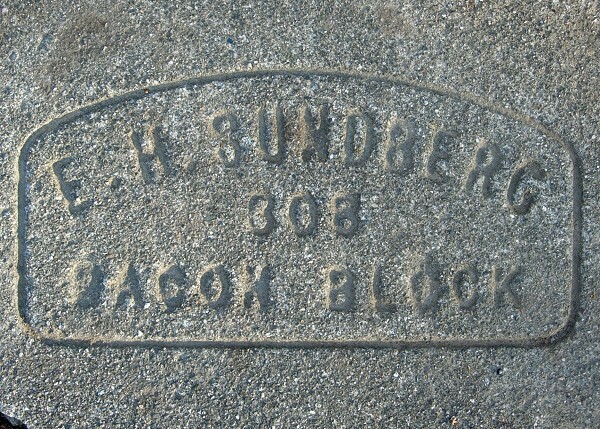 Ernest H. Sundberg, “308 Bacon Block”, is listed in the Bacon Building in the 1912 and 1913 directories and in the Oakland Savings Bank building (not sure where that was) in later years. He’s not listed in the 1921 directory. This mark is rare; I have one dated 1912. I’m still researching this firm. “Bua” is a rare name, so I assume he’s the same person as M. Bua. Roberts may be related to the Roberts Brothers firm (Delore Roberts, president and Arthur Roberts, vice-president), which never had a Bacon Building address. I interpreted this date as 1922, though 1927 is just as likely, and a 1924 date is unequivocal. 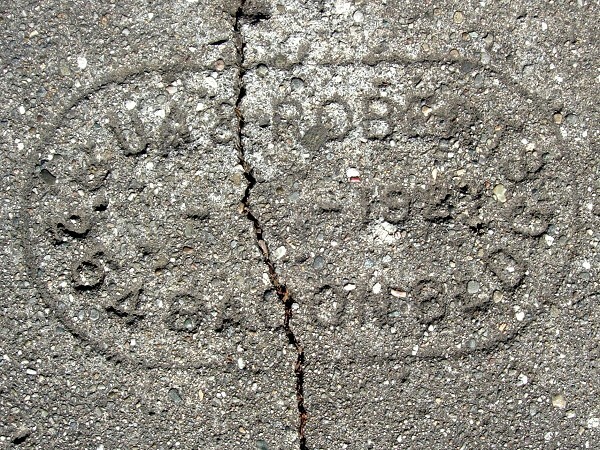 Vallejo Street has a mess of these marks but they’re scarce elsewhere. Can anyone point me to pictures of the Bacon Block? This entry was posted on 22 April 2016 at 11:01 am and is filed under Profiles. You can follow any responses to this entry through the RSS 2.0 feed. You can skip to the end and leave a response. Pinging is currently not allowed. Here’s a 1916 photo of the Bacon Block Building (from the Oakland Museum photo collection). It looks like the BB Building covered the entire block, between Broadway/Washington and 11th/12th. Thank you! That’s an interesting photo that also includes the new City Hall.